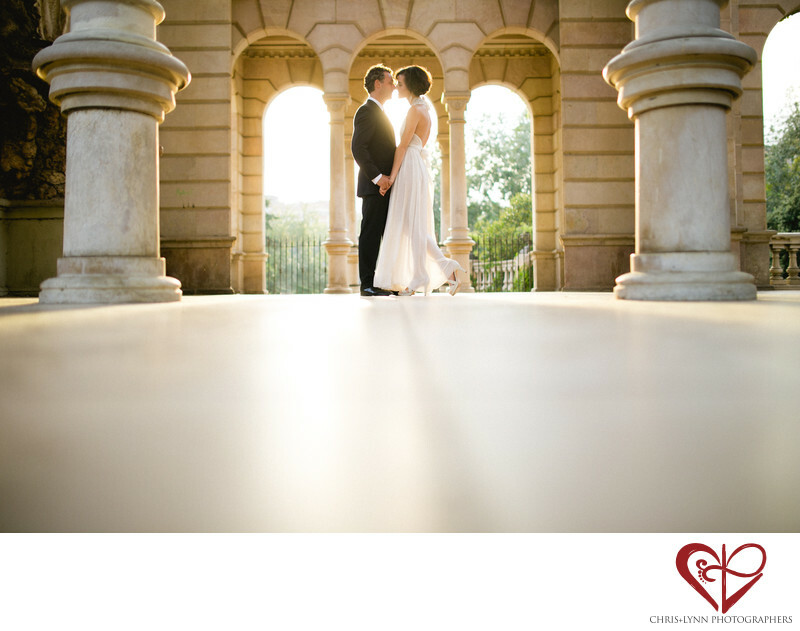 Golden hour is synonymous with beautiful romantic photographs! Approximately ninety minutes before the sun sets is always a great time to photograph couples to create a dreamy light-filled image. For this photo in the terraces of a Barcelona monument, we placed the couple in front of the sun to create a glow around them as they went in for a kiss. We love this backlit look especially with her semi-sheer boho wedding gown. The light surrounding the bride and groom also seems to emphasize the connection between the two of them. That connection - the energy, chemistry, passion, presence - of the couple when they are interacting is one of the factors that makes a beautiful and authentic image. We always try to do all we can to create a positive, relaxed and fun environment for our couples so they can be themselves and show their love for each other freely. We are so thankful for clients who really trust us to capture their unique connection. This image gets its unique low-angle perspective and foreground negative space from Chris laying on his stomach to shoot with a Sigma 35mm f 1.4 Art lens mounted on his Canon 6D camera. 1/400; f/1.4; ISO 100; 35.0 mm.